Ocean City Elementary participated again this year in the Valentines for Veterans Program to thank veterans for their sacrifices and let them know that they are loved, appreciated and not forgotten. This year’s cards will be sent to Perry Point and Charlotte Hall Veterans Hospitals, Baltimore Rehab and Baltimore VA Medical Center. 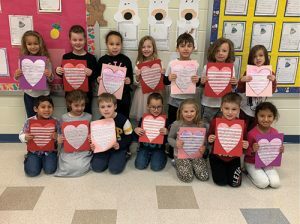 Robyn Diesel’s kindergarten class is pictured displaying their creations.